0600 Hours early edition of February 27, 1942 San Francisco Examiner stand at 14th and Broadway proclaims the removal of Japanese Americans to not-yet-existant interior facilities. Racism and fear swept the West Coast after the attack on Pearl Harbor. Mounting Allied losses in combat, unexpected and humiliating, added to the tension. On February 23, a night attack on the Ellwood oil fields in Santa Barbara by Imperial Japanese Navy submarine I-17 (Commander Kozo Nishino) created a sensation the next day and sparked a new wave of hysteria. Los Angeles was supposedly attacked by air in a false alarm on February 24. The West Coast media had agitated for removal since Pearl Harbor, fueled by the white owners of agribusinesses who wanted to dominate Japanese-owned farms. Columnist Harry McLemore wrote in the Examiner on January 29: "Herd 'em up, pack 'em off and give 'em the inside room in the badlands. Let 'em be pinched, hurt, hungry, and dead up against it...Let us have no patience with the enemy or with anyone whose veins carry his blood...Personally, I hate the Japanese. And that goes for all of them." 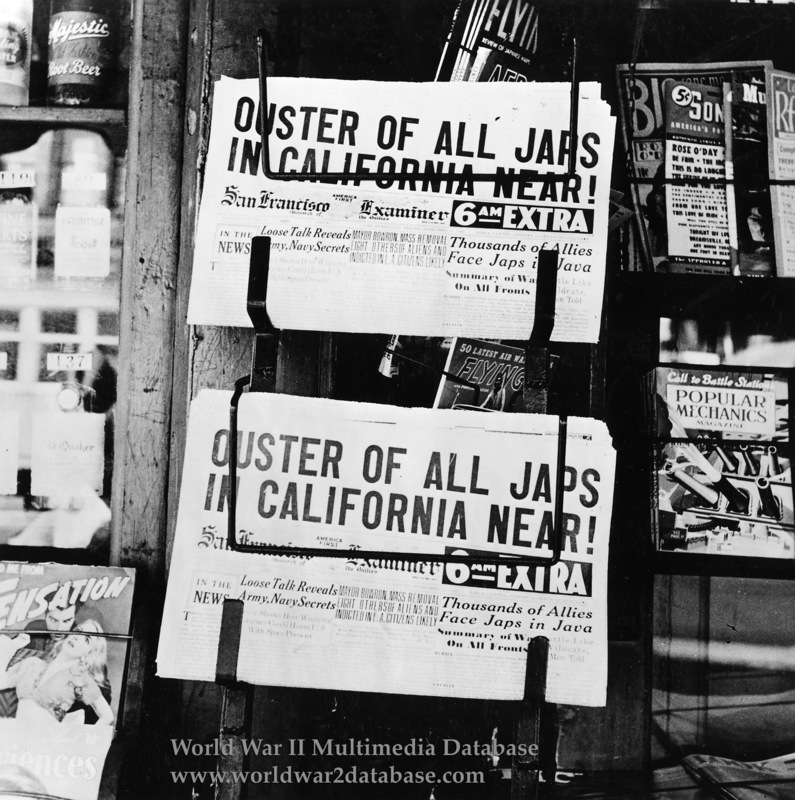 Many papers editorialized against the Japanese Americans as fifth columnists. the San Francisco Examiner wrote no editorials on the internment from March to June, but published dozens of letters calling for internment. Mrs. L. Watts wrote in a March 6 letter, "I think after the FBI has proved that many 'Japanese-Americans' have been betraying our country. The less said by the Japanese the better. Perhaps if they take what is meted out to them with good grace instead of threats of resentment, they can better prove their right to be called loyal." The same day this photo was taken, the US Navy ousted the Nikkei residents of Terminal Island, San Pedro, with only two days' notice. The Japanese Americans of San Francisco had to wait until April to be notified of internment. Some tried to voluntarily relocate when asked, but could not find transportation, food, lodging or gas because of racism. Idaho Governor Chase Clark told a congressional committee in Seattle on February 27 that Japanese would be welcome in Idaho only if they were in "concentration camps under military guard." Some credit Clark with the conception of the internment centers.